Hand made wooden dhows still made today by local craftsmen bear testament to Oman's tradition as a great seafaring nation. They used to plough the sea routes between Oman, Iran, the Arab Emirates, India and other neighboring countries laden with exotic goods and merchandise. Sinbad the Sailor sailed in them from the coastal town of Sur where they are still being built today. 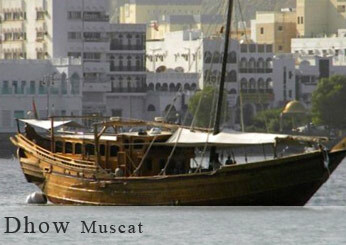 A short drive away from the port of Mina Qaboos will bring you to the Marina where dhows are moored. Tour suitable for elderly and assist persons. Comfortable walking shoes, hat and clothing advisable. Conservative dress is highly recommended (no shorts, minis, sleeveless tops, bare backs). Rest room facilities available on the dhow. A series of wooden stairs throughout the dhow's decks. Dhows comply with all safety requirements.